"Orange juice with the right twist." Blend orange juice, goji berries, and ginger together in a high-powered blender until smooth and goji berries are pureed. Excellent! I loved the ginger and berry taste with the orange juice. Will make again and again! Really nice!!! I loved the freshness that the ginger adds to this drink. I added some ice so it would take more the consistency of a smoothie. 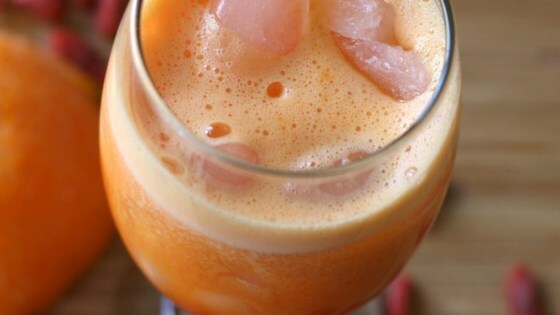 A healthy and refreshing way to start anybody's day. Refreshing with the touch of ginger and goji berries. A great way to jazz up orange juice. The smoothie is not thick, but very tasty. You probably could blend the ice to make it thicker.